As the pagans respected their dead, they used to bury them underground and the Christians did not change this custom, yet they gave it a new meaning, a resting place for the Body until the resurrection. In Malta, we have some burial places like these, and they were commonly called catacombs. these are underground cemeteries, having long corridors dug out of the live rock, with graves cut out as required on either side of them. Such graves had various shapes simple horizontal spaces in the wall, covered tables, or open coffins. In Roman times people were not allowed to bury their dead inside the cities, so we find that most of the catacombs of Malta were dug around Mdina, the most important place of the Island. Amongst these may be mentioned those of St. Paul, St. Agatha, San Katald, Tad-Dejr (all at Rabat), Tal-Bistra (Targa Gap), and Gudja (Hal Resqun). The Church of Malta continued to increase, even though the conditions of the Roman Empire were unsettled. The Maltese Christians of those early times wished that they could remain near their dead and to be with them after death, to wait together with them for the resurrection At the entrance of most catacombs there used to be an "agape" or round love table with slanting sides, the dead body was blessed here before burial, and the mourner took part in a farewell feast. For this reason, they kept themselves away from pagan burying grounds, enlarged their catacombs, grouped their graves, and dug more of them to receive all members of their families. There were also decorated graves and "community' graves, such as for weavers, stonemasons, etc. Tablets that used to cover such graves may be seen at the Catacombs of St. Paul and at the Valletta Museum. 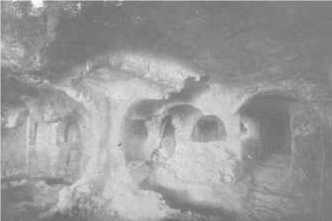 This was also the case of the Christian, In Sicily and Rome, but, though catacombs were not used in those places after the fifth Century in Malta the custom of using them continued for a little longer. Sometimes you hear people say that these catacombs were a place of refuge from persecutions. This was not the case with Malta; they were only resting places for the dead bodies of the faithful. The fact that they had entrances placed on the main roads proves that there was no secret about them. Later, when no more burials took place in them, the Christians use to visit the old tombs in order to venerate the early Christians buried there. We may be almost sure that religious functions were held inside the catacombs on certain anniversaries. All the Roman Emperors before Constantine had been a pagan and many persecuted the Christians, even Constantine him-self had been a pagan, but, on the eve of a great battle against Maxentius in AD. 312, he saw a vision. In the sky before him he saw a shining Cross, and the words 'INHOC SJGNO VINCES" (by this Sign you shall win) around it. To obey the mysterious message, he took the Cross-as his emblem, used the Cross-as his standard, painted it on his soldier's shields, and obtained a wonder­ful victory. He then marched straight into Rome where the Senate made him Emperor in 312.
the ruling of the scattered Roman Empire became very difficult, complicated, and lop-sided, so, Constantine decided to have a new capital Byzantium (later called Constantinople, now Istanbul). On his death (A.D. 337), the Empire was divided amongst his three sons, Con­stantine, Constantius and Constans, and Malta was given to Constantius. When his brother Constantine died, Constans took over his dominions. Later Constans was murdered and so the Empire was united again under Constantius. When Theodosius ruled, he divided the Empire between his sons, to Honorius he gave the West, and to Arcadius, the East. Malta continued to form part of the Byzantine Empire until A.D. 870. After that year, the Empire began to get weaker, and Barbarian tribes attacked it from all sides, To make matters worse, a man who declared himself "the Prophet of God" be­gan a new movement in the East, this man was Muhammad, and his religion, Islam, was based on his book called the 'Koran'. This movement was to have a great effect not only where it was practised but also in Europe and Malta, for it soon declared it­self the enemy of all who believed in Christ.